In order for our patients to receive more information on the fundamentals of Traditional Chinese Medicine (TCM) and associated western symptoms, we are putting together a series of very basic information of each system. It is not meant to be all inclusive or include every combination or possibility of a diagnosis from a TCM perspective, that is up to your practitioner to figure out. Your practitioner will help you understand your specific diagnosis. We are also including some common foods that a patient can eat in order to assist in balancing their energy and associated patterns. 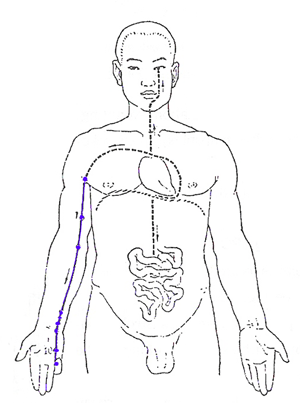 The Heart Meridian travels from the pinky, up the inner side of arm as shown in the picture. -> Continue reading Why our team is the best! Finally getting up to speed with social media and marketing! Pretty amazing how I was so slow to get with the program. I am exited to get going with my new website and blog. Please review our business on Google and Yelp. Everything counts these days. Thanks ahead of time!